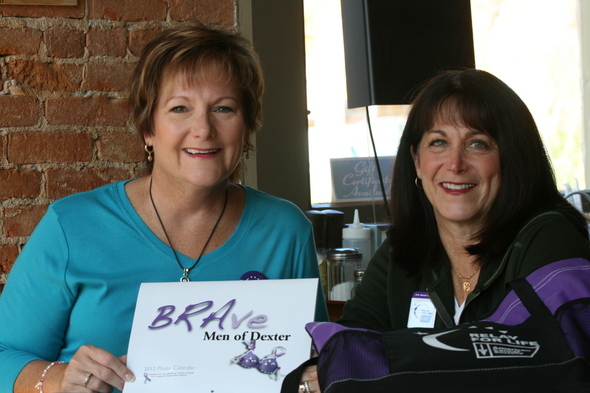 Posted on Sun, Oct 16, 2011 : 10:02 a.m.
From left, Patti Christian and June Mann pose with the 2012 BRAve men of Dexter calendar, a fundraising effort for the American Cancer Society, which recently went on sale. Dexter Area Fire Department firefighter Kyle Jones already is considered one of the brave men of Dexter, but now he’s also one of the BRAve men of the village. Jones is one of 12 male models who posed for the 2012 BRAve Men of Dexter calendar wearing a specially designed bra as part of an American Cancer Society fundraiser. He’s pictured in a watercraft paddling down in the Huron River. “What motivates me in the fight against cancer is seeing some of my family and friends struggle with their own fight with this disease. If my participation in this calendar can bring our doctors and scientists closer to finding a cure for all forms of cancer it’s the least I can do to help those afflicted by the horrible (but hopefully very soon curable) disease,” Jones said. This is the second calendar that features a dozen Dexter men on its pages -- orchestrated by Patti Christian and June Mann, close friends and members of a Dexter Relay for Life Team named Family and Friends. “Patti and I get as much out of this as we give,” Mann said of the planning and sale of the unique calendars, which raise money for all forms of cancer - not just breast cancer. Both women have personal experience with cancer; Christian is a survivor, as is Mann’s husband. Both woman enjoy the calendar experience so thoroughly, they are already working on next year’s edition. “Many of our models are survivors or battling cancer or know someone who has been through the fight. One is a three-time survivor,” Christian said. The cover of the 2012 BRAve Men of Dexter calendar. Last year, all 250 calendars sold, and this year the publication already is on sale. Last year, it was not available until just after Thanksgiving. “It makes a great Christmas gift,” Mann said. The calendar can be found at Dexter Pharmacy, Busch's, Country Market, Dexter Bakery, Master Lockmans Black Belt Academy, Terry B's in Dexter and Contempo Salon and Spa in Ann Arbor. The cost is $20 cash or check made payable to American Cancer Society. To fund the calendar, Christian and Mann find local sponsors who pay for the cost of the printing and Shrink-wrapping, which was done by Adair Printing of Dexter. Anne Savage, the photographer for both calendars, donated her time to shoot the pictures, they said. If anyone has suggestions for future bra designs or models, or would like to sponsor the calendar or donate a decorated bra, email bravemendex@gmail.com. Mon, Oct 17, 2011 : 1:53 p.m. Thanks for realizing that cancer is not only breast cancer, there are hundreds of different forms that it can take. Lately the emphasis is on breast cancer, leaving other types somewhat neglected. Thanks again for remembering the rest of us. Mon, Oct 17, 2011 : 3:10 a.m.